Here are 3 free Windows 8 Timer apps that let you set timers and keep track of a number of activities. We often need to keep track of a number of activities in our daily lives. A timer is a very useful tool in such cases where we need to measure the time interval. Windows Store contains many such free timer apps that act as a multipurpose tool for managing various activities throughout the day. These timer apps are very easy to use and help in measuring time intervals for various activities. Some of the timer apps offer a simple timer, while some are integrated with multiple tools such as world clock and stopwatch. Some timer apps also have special features like ability to display time in analog as well as digital mode, and setting timer as a live tile on your Start screen. The timer apps that we are talking about are Free Timer, yourTime, and TimerPro. Free Timer is a simple Windows 8 Timer app freely available in Tools category of Windows Store. 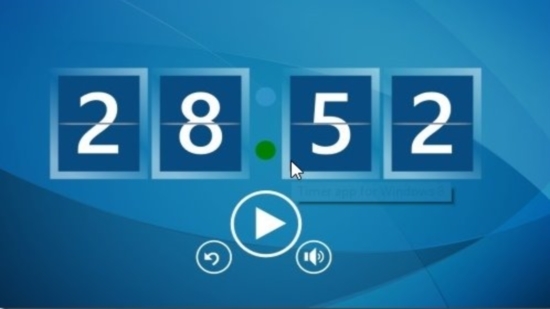 The app counts time in digital mode and has simple options of Play, Restart, and Volume. You can set timer and measure time intervals for the activities you like. You will hear a ring as soon as the timer stops. This will keep you notified about the set time. Click here to get Free Timer. 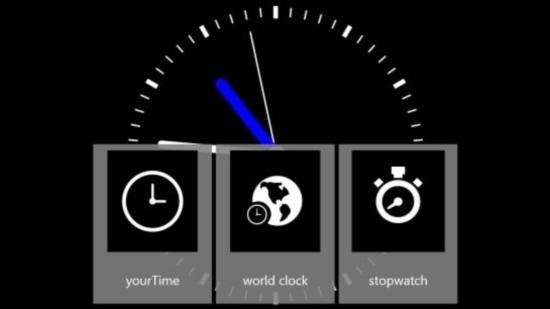 yourTime is a free Windows 8 Timer app that consists of a StopWatch, a Clock, and a World Clock. The StopWatch in the app acts as a timer which lets you measure the time taken during a particular activity or event. The Clock displays time in analog as well as digital mode. Using the World Clock, you can compare time at various places around the world. The app is freely available in Productivity category of Windows Store and can be set as a live tile on your Start screen. The live tile displays the current time and date on your Start screen. Click here to get yourTime. 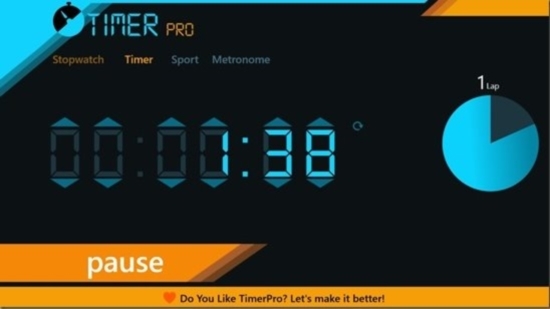 TimerPro is another free Windows 8 Timer app that offers multiple tools including Timer, Stopwatch, Sport, and Metronome. It is indeed a very useful timer tool that offers a variety of timers for different types of activities. The app is freely available in Health & Fitness category of Windows Store. As you launch the app and use it for the first time, it will guide you through various steps of using the app. Timer option shows a digital counter and displays how much time lap you have covered during a particular activity. You can pause the timer anytime in between or refresh it to set a new timer altogether. Stopwatch of the app displays an interval option that updates you on how much you are progressing. You can import this interval file to your clipboard, and copy it to any text editor. Sport option lets you decide the number of laps, working time, and rest time. This is especially helpful when you have to do an activity repeatedly for a number of times, after a fixed time interval such as workouts. In metronome option, you can set beats and tempo. Thus, this option is useful while doing activities like dancing and aerobics. Click here to get TimerPro. These were some of the useful timer apps we have found. Try these to keep a close watch on your activities. Share your feedback via comments.